Italy is the country of simple pleasures. It became clear to me when I ordered a green salad to go with my pasta. I am not sure what type of green it was. I think it might’ve been baby spinach. But that was it. A green salad. I was provided with olive oil and balsamic vinegar . What else would I need? Certainly not one of those horrendous mixtures in a bottle we fondly call salad dressing. Where do I begin? Al dente, a smattering of sun dried tomatoes and a flash of garlic. Heaven. There is a good reason why Italy is one of the most popular destinations. I love Rome…walk around any corner slap bang into another temple being excavated. It is a treasure trove for ancient history enthusiasts. Likewise with Florence, a great base to explore Cinqe Terra. And then there is Venice….so much to love about this city of canals. Stresa has been a delightful surprise for me. Perched on the shores of Lake Maggiore it offers all the old fashioned grandeur of a bygone era when the aristocracy went on “the grand tour”. Stately hotels along the lake shore offer chintzy rooms and white glove service. Here you can hop on a ferry to discover the islands. Napoleon loved it here and so will you. My favourite is Fishermans Island which even has a couple of small hotels. The old town centre of Stresa is tucked away and is full of pedestrian cobbled streets and lovely piazzas. I have never heard so much bird song ….and they do have signs in the restaurants asking you not to feed the birds. I guess the happy singing means that the patrons are ignoring the signs. Stresa, ciao for now….but I will be back. It’s what Italy is all about and maybe it is better than shaking hands. Let’s face it – with most double kisses you are not really kissing the persons cheek – just rather touching their cheek with your cheek so probably way more hygienic than shaking hands. And everybody does it …. Don’t you think Obama looks quite handsome here – wonder what Michelle thought? It can sometimes cause confusion amongst non-Italians because when does a regular kiss-on-the-cheek greeting become the double kiss? It’s hard to tell really and then you have that hanging in the air second kiss. That’s embarrassing. The best way around this is to make it very clear that you are a double kisser. Firmly place your hands on the persons shoulders and then lean in for the first kiss, lean back and then without letting go of the shoulders do the second kiss – then no one is taken by surprise – even if they don’t like it very much. It’s very common for men to double kiss too – not just in Italy but in many countries around the world. When visiting Italy the kissing double cheek thing becomes habitual. Sometimes it almost feels rude not to. It’s kinda nice – makes you feel as if you totally belong and you can imagine that you were raised on ravioli and can carry on a lengthy conversation just with your hands. You can, however, get carried away. After an amazing stay in Italy and on our transfer to the airport in Florence the taxi driver entertained us with typical Italian flair – i.e. talking non stop, waving his arms around, having a conversation with his brother who rode alongside on his scooter – you know what I mean! I love Italy and it was with great gusto that I said goodbye to the taxi driver with the old Italian double kiss. What my husband didn’t realise was that set the tone and when he tried to shake hands he was grabbed by both shoulders and yes – double kissed. Now I have to tell you that our taxi driver had a pretty heavy designer stubble thing going on. “Is that what you women have to put up with?” he asked. PS – this was NOT the taxi driver……. just thought it would add some glamour to the post. Oh Mama Mia – those Italian men! My sister and I could not understand it. It seemed that many of the men either driving the water taxi or working the tables in Venice must surely be in the movie business. Maybe Venice is a little like LA – Italian hopefuls end up there serving on tables while waiting for that big break. They are so charming, these Italians. Maybe it’s all that good food. Caprese Salad like you will never ever taste in North America. Or maybe it is the fact that in true Italian fashion they have been “mothered” since they were little and just know how to turn on the charm when the women are around. 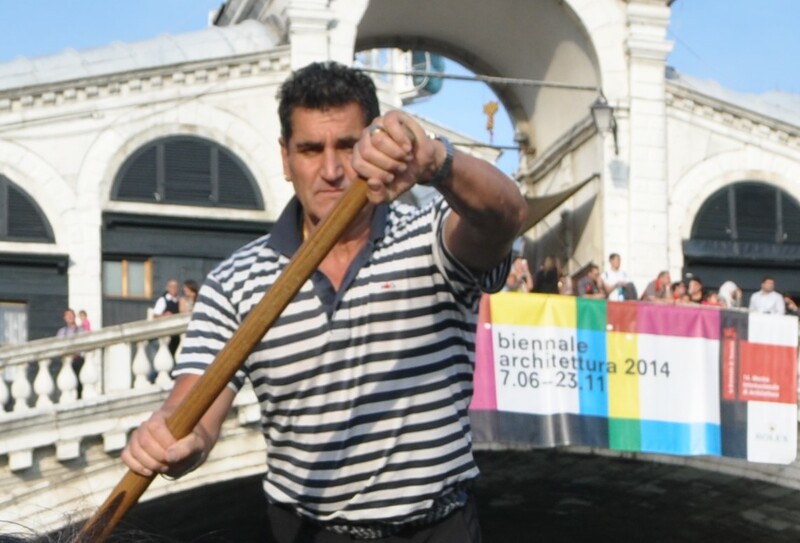 Witness the Gondoliers! Ours told us he was close to 60 but didn’t look a day over 35 …. well maybe 40. I suppose all that “gondoliering” every day kept him in shape – and the fact that he was onto his third wife. As he told us – a wife is not like a washing machine. When a washing machine breaks down you call the plumber. When the wife breaks down you get another… Oh my goodness – I can just hear every feminist within a hundred miles screaming. The fact is he told us this story with a twinkle in his eye so who knows? Never trust a man with dimples, that’s what I say! Not in bad shape for someone nearly 60! Just shows you what daily exercise and the Mediterranean Diet will do for you! 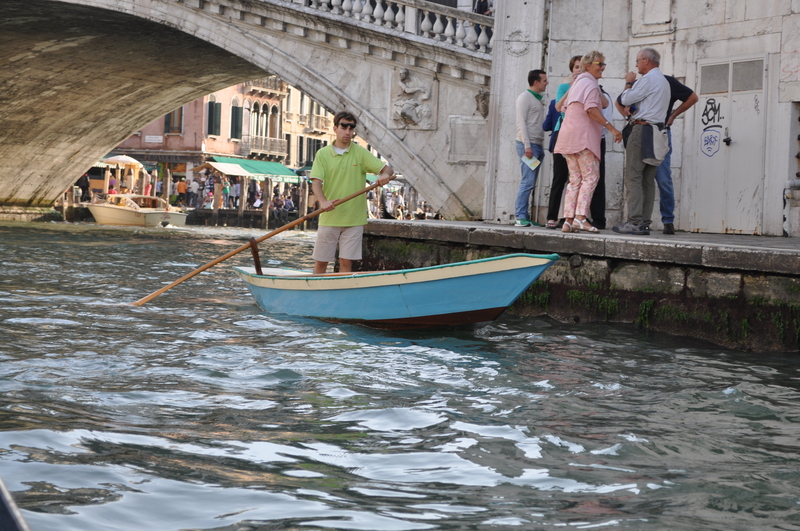 Now there are some who would like to be a gondolier but just don’t quite get the idea. Like this lad…. but let’s give him ten out of ten for effort. Another thing about Italian charm …. it has longevity! 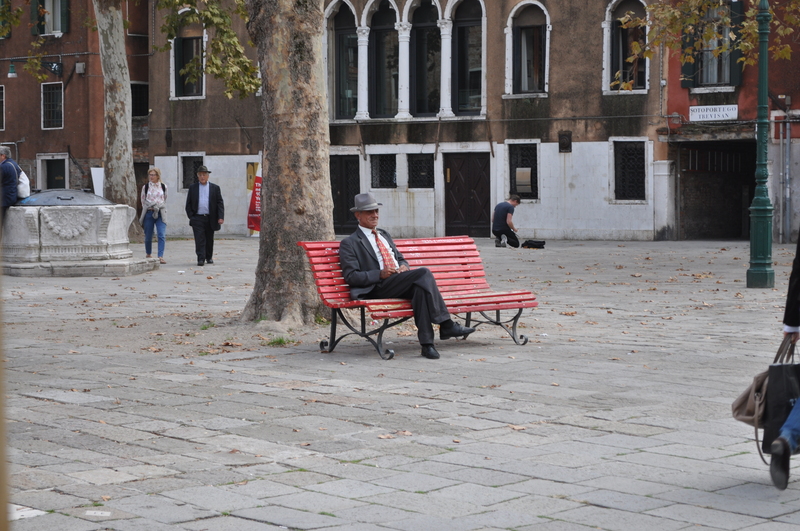 We chanced upon this older very well dressed man sitting in one of the piazzas in Venice. My sister couldn’t resist getting a photo of him.